Wat Visoun locates in the south of Mount Phousi is a replica of an older Wat, which had been erected in the same place in 1513. Even though the replica has been built only in 1898. 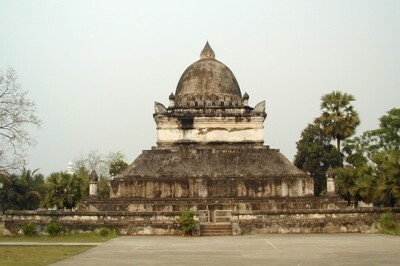 The wat's most notable feature is the large squat stupa in its forecourt. The stupa is properly know as That Pathum (Lotus Stupa) but is more commonly known as That Makmo because its shape resembles a watermelon ('makmo' means watermelon). The stupa was originally constructed around the turn of the sixteenth century. Its interior was originally filled with hundreds of small Buddha images fashioned in precious metals and crystal.